It was going to happen sometime, and it happened today. Hulu announced their subscription service. Despite the worries of some people though, it's not going to replace the currently free service, but will be an addition. The promo video (which wordpress won't let me post here but can be watched at this link) talks about three main areas, accessability/devices, content, and quality. Those are the highlights of our new player. Before we move on to the other updates to our site today, let me address a related topic that’s been in the news a lot recently: HTML5. Plenty of users and members of the press ask about this topic all the time. When it comes to technology, our only guiding principle is to best serve the needs of all of our key customers: our viewers, our content partners who license programs to us, our advertisers, and each other. We continue to monitor developments on HTML5, but as of now it doesn’t yet meet all of our customers’ needs. Our player doesn’t just simply stream video, it must also secure the content, handle reporting for our advertisers, render the video using a high performance codec to ensure premium visual quality, communicate back with the server to determine how long to buffer and what bitrate to stream, and dozens of other things that aren’t necessarily visible to the end user. Not all video sites have these needs, but for our business these are all important and often contractual requirements. That’s not to say these features won’t be added to HTML5 in the future (or be easier to implement). Technology is a fast-moving space and we’re constantly evaluating which tools will best allow us to fulfill our mission for as many of our customers as possible. Yes, technology moves quickly, as does code, but I'm pretty sure there's been no major developments in the last 6 weeks. It's a complete about-face. Is it about making things better, or about seeing a potential market slip away? There's no telling. What will hulu+ be like. and ultimately, will it be worth it? Back in April, the Consumerist ran a poll asking if people would consider it, and almost 2/3 of them said no. 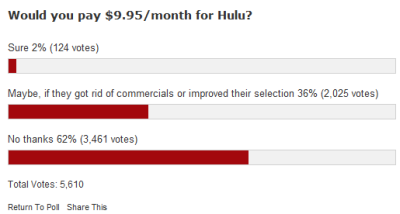 Only 2% said yes, and the other 36% said said, if they got rid of adverts or increased the selection. They're doing the later, somewhat (albeit via retention, rather than getting more different programs). I personally won't pay, but in case the trial they're talking about is free, I'll certainly give it a go. Ultimately it comes down to Cost vs. Convenience. I don't watch the Daily Show on comedy Central's site, because the player is bugger, and the few adverts are cringe-inducing. I'll just not watch the show. Instead of a small cut from the adverts when I watched it on Hulu, they now get nothing (they [viacom] pulled the Daily Show and Colbert from Hulu because they wanted more money from the adverts). It's this sort of greed that can take a profitable company, and burst it's dot-com bubble.